Independent third-party testing indicates that Air Science Purair Advanced Fume Hoods not only provide a high level of operator protection in the event of a fire, but with certain precautions also offer fire suppression capabilities to minimize damage. Fume hoods are designed to protect operators, the environment, and equipment from a variety of contaminants which are often volatile and highly combustible. Many scientific disciplines require the use of potential ignition sources, such as hot plates and electrical equipment, further increasing the danger of fire. High quality fume hoods should not only protect the users from potential chemical contamination but should also have built in measures to protect against potential fire hazards. 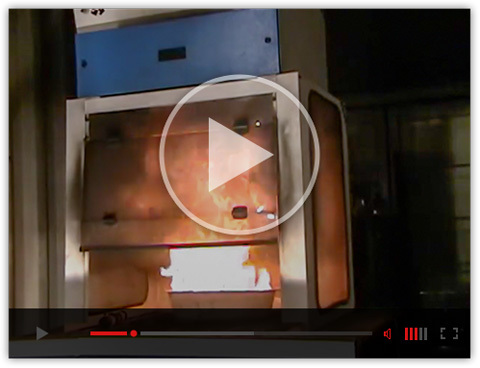 A third-party testing facility performed fire testing on the Purair Advanced series of ductless fume hoods with steel substructure, testing for both fire containment as well as suppression with a commercial FireFoe system installed. The Purair Advanced ductless fume hood successfully survived a series of three controlled burns fueled by acetone without structural failure of the hood. The findings of this study indicate that the Purair Advanced series of fume hoods offer an additional level of fire containment to increase safety of operators and researchers. At Air Science, you are our top priority. We build safe and technologically advanced laboratory equipment so that you can make paradigm-shifting discoveries by day and return home safe to your loved ones at night. Download the full whitepaper to learn more about the testing results for the Purair Advanced. You can also learn more about the Purair line of fume hoods by visiting our product page. Contact us today to obtain a custom quote based on your particular needs.